There's more to do than study at school. For example, you can draw amazing pictures on the chalk board. So, let's have another look at just that. 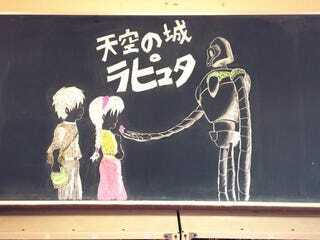 Last fall, Kotaku took a look at some of the terrific chalkboard art found in Japanese classrooms. Some of these drawings were done after school during club activities. Others were done during breaks throughout the day. Many, it seems, were done by students! This one, though, was done by the art teacher to wish students a happy birthday. Easy to see why he's the art teacher, huh? Some of the drawings commemorate events or cheer on sports teams. Others are simply a way for students to express themselves or show their love for a favorite anime or a beloved character.